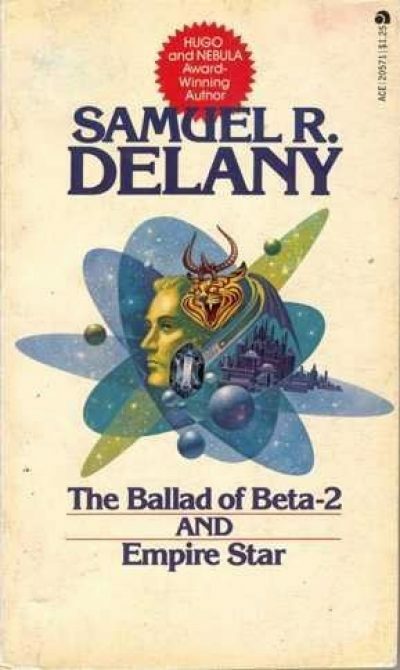 The Ballad of Beta-2 and Empire Star is a 1976 omnibus of Samuel R. Delany’s 1965 novel The Ballad of Beta-2 and his 1966 novel Empire Star . It’s not quite my first pick for a Delany review for my Because My Tears are Delicious to You series (more on that later), but it is as close as I can come with my current library. These are both very early Delany novels. Expectations based on later works like Dhalgren, Triton, or Through the Valley of the Nest of Spiders may well be misleading. These two books are also very, very short. Almost novellas. Brevity does not mean simplicity. The Star Folk! What a glorious name! What a deplorable reality! Their flotilla of star ships spent twelve generations traveling from Sol to the Leffer system, only to arrive in a system that has already been settled by humans, thanks to the much faster, much safer hyper-drive. Isolationist and backward, the Star Folk seem content to remain in the orbiting reservation the Federation granted them. As far as ambitious anthropology student Joneny is concerned, being assigned to study the Star Folk is not an opportunity but a punishment, a task that offers no chance of professional glory. His mentor disagrees, if only because no other culture has ever experienced the depths of interstellar space. So it is that Joneny is sent off to take a closer look at the Star Folk. Joneny’s initial impression of the Star Folk was based on one superficial study by a scholar who considerately “corrected” some results when the data didn’t line up with expectations. Something terrible happened to the Star Folk out between the stars, something that left entire ships filled with corpses and reduced others to clouds of debris. Something whose legacy, as Joneny discovers, is still very much with the Star Folk. It seems to me that an absolute prerequisite for recruiting people to staff generation ships is that the recruits must never have read any story set on a generation ship, because if they were familiar with stories set on generation ships they would know that they were consigning their descendants to miserably constrained lives, social and genetic degeneration, rampant mutation, and fair odds of being wiped out by some unforeseen hazard of deepest space. The Star Folk might seem an unpromising lot—they certainly do to Joneny—but considered against the travelers in stories like Orphans of the Sky or End of Exile , they’re a success story: they got where they set out to go, or at least the survivors did, and they retained some of the culture they set out with. They also picked up something extra along the way, so yay! Eighteen-year-old Comet Jo leaves his humble but familiar life after some dying travelers beg him to deliver a message to the distant Empire Star. There is no direct route from Comet Jo’s native world, Rhys, to Empire Star and the convoluted path he follows to reach his destination will expose Jo to all manner of things he could never have imagined back on Rhys. Things that include the Matter of the Lll. What’s going on depends on the way you look at it and as Jo discovers, picking the right perspective can be a tricky thing in an empire that spans both space and time. Let me begin by saying “Tau Ceti isn’t a red giant and it is not orbited by a white dwarf.” Also not by a gas giant (and habitable moon) in a Goldilocks orbit, but we didn’t know that a half-century ago. Interesting to see the habitable moon detail in this story; this and not “The Longest Voyage” may be where I picked up my fondness for that setting detail. The Ace Science Fiction Reader was an … interesting mix of works. All three authors were Hugo winners, but in all other respects they were not that much alike. 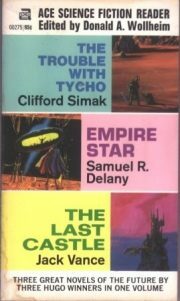 Vance and Delany were more stylistically ambitious than Simak (and The Trouble with Tycho was an especially unambitious Simak, as is this review of it), but the two stylists held starkly different political views. Vance’s The Last Castle lacks sympathy for the enslaved Mek. Delany, in contrast, objects to the mistreatment of the Lll. I came away from that Ace Science Fiction Reader with an inarticulate loathing of Vance’s fiction (which is one of the reasons I didn’t read much of his oeuvre until the 21 st century). Delany, on the other hand, intrigued me,. I wasn’t sure I completely understood his writing, but Empire Star’s recursive plot was interesting enough to keep me collecting Delany’s fiction. I don’t think the omnibus is currently in print, but its components are. Empire Star can be found in the 2006 collection, The Space Opera Renaissance. Both Empire Star and The Ballad of Beta-2 (and many other Delany works) are available as individual ebooks from SF Gateway.